Jadeveon Clowney, DE, South Carolina–Right off the bat, we have our odds-on favorite. How do you beat a guy with “clown” in his name who is likely to be the number one overall pick in this weekend’s draft? And his mother Josenna works in a Frito-Lay plant, to boot. Josenna Clowney in a Frito-lay plant? Some people are just born to live on this blog! Clowney is going to be tough to beat, but this next guy might just give him a run for the money. This entry was posted in Uncategorized and tagged 2014 NFL draft, football, funny names, funny names in the nfl draft, Ha-Ha Clinton-Dix, Jadeveon Clowney, NLF draft, Zsa Zsa Gabor. Bookmark the permalink. This was a lot to take in. 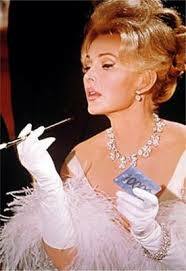 Unlike the many Xaviers of the world, Zsa Zsa is, to my knowledge, the only one w/ such a monikor (and she’s rocked it for 97 yrs, so good for her). I am of the school that an apostrophe is unnecessary if there is no contraction. So Ha’Sean would have to be shorthand for “have Sean” (which his mother did) or “happy Sean.” Unless the nurse misinterpreted, “Huh? Sean?” on the certificate…So he gets my vote, as I empathize each time he faced roll call every September in school. I’m sure Clowney is no Clooney. Do you stress the second syllable? I do wonder if Purifoy has a custom helmet. He is indeed like a more culturally diverse conehead, like if Garrett Gregory was their neighbor. I hope he does not get called Douche-iez Purified. I think that’s redundant. And Ego sounds like a part of the nominative determinism team, right? Cassius Clay sure had a big head for awhile, as you say. Maybe Ego is even prettier. Nice work, Mark. I will not call you Marky Mark. I really want to, though. Haha +1 for a Nominative Determinism reference. +1 for a Cassius Clay reference (you may know by now I’m a huge boxing fan). +1 for wanting to call Mark “Marky Mark”. Wow… if only these points counted for something! Sorry to let you down. But still, you’ve been making quite a splash! Shouldn’t the points be good for shopping at the BoFN gift shop? If Kerbey earns enough points she might be able to get the miniature “Horsey” award for her mantel. Ahhh, good idea! I like the idea of a BoFN gift shop! Now that’s the entrepreneurial spirit! can we sell snacks? And we’ll need a bar, too. P.S. I love that there’s a funny name that features “dave” in it. I can have a funny name vicariously through Jadaveon Clowney! There you go. And by the way, it seems that the Bill Clinton/Monica Lewinsky joke follows him wherever he goes. The nickname, though, came in his infancy. Ha’Sean is actually pronounced ha-seen and his mother just found it easier to call him “Ha” which then got extended to Ha-Ha. Oops. Looks like I have to burst your bubble. I spelled it wrong. It’s Jadeveon, not Jadaveon. I think Dave would have found dave in there either way. Here’s the story on the name, straight from the Ha-Ha’s mouth. Ha’Sean is pretty brilliant. Unfortunate about the Clinton-Dix. Surely he could’ve picked just one instead of opting for the double-barrel, unless of course he was trying to win this contest, which he may well have been, in which case more credit to him! Grand stuff, Mark! Haha, (sorry… I mean Ha Ha). I think trying to win this contest is a noble pursuit! Nice one! And I like that my vote got the most votes! Zsa Zsa . . . Didn’t she play for the Green Bay Acres? “Didn’t she play for the Green Bay Acres?” Nice. That was her sister, Ava.